Credit unions know how important elections are to their very structure and operations, but you can only get members to vote if they are aware of the election. We recently presented a webinar to share our expertise and offer 10 proven ways for credit unions to increase the visibility and awareness of their elections. How does having new candidates on the ticket promote your voting event? To ensure your election is newsworthy and relevant, you need to have enough candidates to make it a contested election. Unopposed elections feel unimportant and many members don’t see the point in participating when the outcome is predetermined. Actively and consistently seeking new candidates will provide you with a constantly evolving list of qualified potential candidates for your election. This makes the process much easier than scrambling at the last minute to find someone – anyone – who will agree to run. So, how do you find new candidates? Advertise the nominations process and be clear with exactly what you’re seeking. Look to members who are already involved on a committee – they’ve clearly expressed an interest in the future of the credit union. Create an associate director program to develop and evaluate future talent. Solicit recommendations from the board of directors and petitions or nominations from members. Did you know that only 28 percent of credit union boards have term limits? Because of this, incumbents rarely lose in elections and members may see elections as irrelevant. Additionally, the lack of change discourages new ideas, skills and board diversity. The solution is to carefully encourage change among the board. Consider adding term limits (three years is considered best practice) and make the election a pivotal part of the evolution of credit union leadership. All members need to be aware of your upcoming election, when it will happen and how to participate. Making this happen requires a comprehensive communications strategy. Advertise your nominations process widely and explain how the process works, give key dates and qualifications for running. Start publicizing your election open and close dates 8-12 weeks prior to the open date. Map out a general election schedule with key dates and create marketing materials for each point in the election cycle. Be sure your promotions appear everywhere from print materials to digital banners on your website and everything in between (including staff email signatures). SBS has sample communications and reminder plans we’re happy to discuss at any time. Simply contact us and we’ll share! Another way to promote your election is to allow the people most invested in the process – the candidates – to spread the word. Increasing awareness and education of candidate platforms. Harnessing the energy and networks of the candidates. Carefully monitoring and providing equal treatment among candidates to ensure no one has an unfair advantage. Creating and enforcing new rules around campaigning. Ensuring a positive experience for candidates regardless of the election outcome. If you decide to allow for campaigning, check out our article on 8 Tips for a Successful Campaigning Policy. Distribute educational materials and collateral such as ballots, biographies and voting instructions at each branch. Display posters, advertisements and digital signage at each branch. Host in-branch information sessions about the upcoming election. These are particularly effective when coupled with a larger overall event such as member appreciation day. Hold an in-person “Meet the Candidates” session or a candidate open house to recruit new/additional candidates. The more you remind members about your upcoming election, the more likely they are to vote. When you send reminders can also influence when participation happens. Strategically plan your reminders so when voting starts to trail off during your election, you can deploy another reminder to encourage response. The social media channels and strategies your credit union utilizes are important ways to communicate about your election with members. Not only should your organization be using social media for this purpose, but you can encourage your voting members to do the same – when members share their election participation, it often creates a reminder and social pressure for others to participate in the election. Social media also takes advantage of exciting new technology advances and appeals to your younger members. SBS has developed new technology to make voting more convenient, which raises response and engagement rates. QR Codes allow members to simply scan the code with their mobile device for instant access to the election. Embedded login links allow members to click on a customized link that automatically authenticates them, giving them instant access to the election online. Single Sign On (SSO) allows your credit union to have online voting capabilities patched directly into your website. When members sign in to online banking, they can have direct access to the ballot to cast their vote. To date in 2015, SBS has seen that 15 percent of web voting is done via mobile device. It’s important to make sure each member gets an optimal voting experience tailored to the mobile device they’re using. Make voting quick, make it clear and make it convenient and you’ll be most likely to see an increase in participation. Consider your members and demographics then research the best ways to communicate with your members – on-site and mail-in elections will be most effective with some members while online and telephone voting will be more popular with others. Though we all know it should be, the democratic structure of a credit union is sometimes not enough to get members to vote. Offering incentives such as door prizes, raffles for gift cards, electronics, etc. or contests for the first 100 voters can generate excitement and drive participation. Prizes should be tied in to your credit union as much as possible such as reduced safe deposit box fees or skip-a-pay on a member’s next loan payment. Be sure to check with your credit union’s policies and bylaws to ensure contests and drawings are permitted. 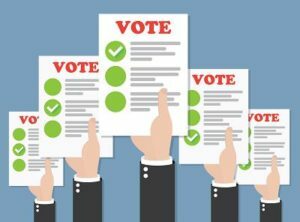 By encouraging a competitive election, promoting and communicating clearly, making voting convenient and offering incentives to vote, your credit union members will be well informed to cast their ballots. At SBS, our mission is to improve elections. Participants in this webinar received a free copy of our eBook “10 Expert Tactics to Increase Election Participation” and a copy of the video recording. To view the webinar recording, follow this link. And contact us any time for more information on effective tactics to promote your credit union election.